September 29 is Michaelmas Day, a major Christian Feast, marking the Equinox. It is one of the "quarter days", signalling the beginning of each quarter of the year and welcoming each of the four seasons. These holidays were communally celebrated during the "Age of Faith", reassigned from already established astrologically-based pagan festivities. The other quarter days are Christmas on December 25, Lady Day (Annunciation) on March 25 and St John the Baptist's Day on June 24. September's Equinox in much of Europe marks the traditional end of the harvest, when sickles and scythes slash and snip in the reaping of the grain. As harvest ends, the grain is stored in the granaries and meats and fish are salted, to be eaten during the wintry months ahead. Astrologically, the Equinox marks the beginning of the sign Libra – the exaltation of Saturn, the grim reaper! Michaelmas (pron: "Mickle-mus") is the Christian Harvest Feast marking the Equinox, held on September 29 in honour of St Michael the Archangel, one of the principal angels in the Christian heavenly host. Angels are believed to be divine beings who serve as messengers and representatives of God – though in Michael's case, he was also the chief general of the divine army responsible for expelling the Enemy, the rebellious archangel Lucifer and his gang of fallen angel followers from Heaven. According to the Catholic Encyclopædia, his name, which means in Hebrew: "Who is like God? ", was the war-cry of the loyal angels in this primeval celestial battle [Revelations 12:7]. St John speaks there of the great conflict at the end of time, which reflects also the battle in heaven at the beginning of time. There are several other explicit references, but according to the Church Fathers, St Michael also appears in scripture where his name is not always explicitly mentioned. They hold that he was the cherub who, after the expulsion of the now self-conscious Adam and Eve, stood at the gate of paradise, "to keep the way of the tree of life" [Genesis 3:24]. He was the angel through whom God published the Ten Commandments to his chosen people; the angel who stood in the way against Balaam (Numbers 22:22 sqq. ); as well as the angel who routed the army of Sennacherib (2 Kings 19:35). According to the "Saints" section of the Catholic Online resource, Holy Scripture describes St. Michael as "one of the chief princes", and leader of the forces of heaven in their triumph over the powers of hell. He has been especially honoured and invoked as patron and protector by the Church from the time of the Apostles, for he is the champion of the Jewish people, and by extension, of all Christians, the inheritors of the Jewish tradition. Although he is always called "the Archangel", the Greek Fathers and many others place him over all the angels – as Prince of the Seraphim. Tradition holds that he is the Angel who told the Virgin Mary of her approaching death. According to Muslims, who also revere him, Michael's body is covered with fine hairs and each one, like a tongue, implores the mercy of Allah on behalf of sinners. St. Michael is the patron saint of grocers, mariners, paratroopers, police, chivalric knights, and sick people. He is represented in Christian Art as a beautiful young man, winged, clad in armour, and with sword and shield combating the dragon. He often holds a pair of scales in which he weighs the souls of the departed (or the book of life to show that he takes part in the judgment). The relationship to the Equinox is thus made specific, as the astrological symbol for the sign Libra, which always commences at the Equinox, is of course, a set of scales. Even though St Michael is a Christian figure, his festival contains elements of both Christian and ancient pagan practices. In fact, in Germany anyway, St Michael replaced the pagan god Wotan (or Woden, the cognate god of Mercury) after the Christian conversion of the Germanic peoples. 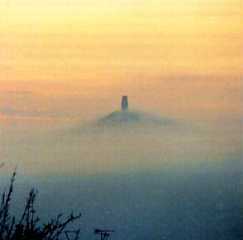 There are many chapels to Michael in Germany, especially on mountains, which were sacred to Wotan in the pre-Christian era. 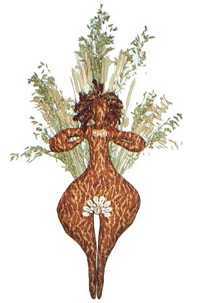 Interestingly, one of the oldest pagan practices is the corn dolly. This was made from the last sheaf of wheat of the harvest and was woven into a human shape, to take the place of honour on the harvest feast table. This dolly was kept until the spring and ploughed into the first furrow to bring fortune and fertility for the new farming year. As one of the Quarter Days, Michaelmas was when the new accounting and farming year officially began. Workmen would be hired and accounts would be settled. Unfortunately this feast is no longer the grand event it once was, nor is it so noted for its hospitality. In England, the entire autumn season is known traditionally as Michaelmas. Many traditions of our contemporary harvest fairs have their origins in mediæval times. Michaelmas fairs were and are a focal gathering for farmers and merchants. The Feast of Michaelmas was important during the Middle Ages, when it was often the occasion of a fair and an associated feast. It appears that the custom grew out of the practice of rural tenants bringing a stubble-goose to their landlords when paying their rent, or to encourage them to be lenient if money was short. At this particular time of the year geese were plentiful and at their best, owing to the benefits of the stubble feeding. Since the landlords received many more such presents than they could themselves consume, they passed them over to their friends or acquaintances. In this way the Michaelmas goose became a standing dinner-dish. The Michaelmas glove – often more than six feet tall, made of leather and stuffed with cotton or wood chips – would be hung up to announce the beginning of the fair. This glove declared that the town had the sanction of the mayor, nobleman or king to hold the fair, such as one given by King John to the town of Sturbridge in 1211. It stood for the handshake of promises, openhandedness and generosity. The fair itself would draw merchants from great distances to trade in all manner of goods in a square or a building called (for the occasion) Pie Powder Court. Derived from the French pied poudre (dusty feet), this referred to the long roads travelled on foot, and was a court of justice for and by the travellers. Another tradition of Michaelmas is the use of ginger, a spice used to flavour beer and wine, fish and sweetmeats. All manner of foods seasoned with ginger are part of the day's menu from gingerbread to ginger beer. The tradition may indeed have its roots in the Middle Ages, since it is said that a wealthy merchant once brought a shipload of the rare spice to sell at the Michaelmas market. When a high tax was levied on his cargo, he refused to pay, choosing instead to pass the ginger out to any who wanted some. Ginger may also be the flavour of Michaelmas because St Michael is the patron saint of healers – and ginger is a good remedy for stomach and chest illnesses. As well as this, Michaelmas marked a number of significant social turning points. 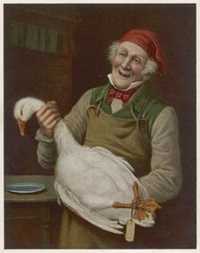 Wheat and rye were sown from Michaelmas on to Christmas and it marked the start of the fiscal year for tradesmen. Michaelmas is used in the sense of autumn, naming the first term of the academic year for various educational institutions in the United Kingdom and Ireland (typically those with lengthy history and traditions). Michaelmas Day is also the day when, by hallowed custom, civic and municipal officers are elected all over England, particularly the Lord Mayor of London, and Lord Mayors of other cities. People instinctively felt an analogy between their chief magistrates and guardian angels, as the former presided over and protected the people, just as the latter protected their souls. An ideal Mayor-choosing Day, then, as St Michael the Archangel is known as the guardian and protector of the Christian Church, the established Church of England. The Michaelmas Daisy is a member of the aster family, a flower which has had a long history of mythological importance, medicinal value and religious significance. Aster means "star" – the name comes from the same root word as astrology and asteroid, asterisk and disaster – and in England it is often known as the starwort (wort meaning "root", signifying plants with healing properties). The aster was sacred to the gods and so wreaths of asters were placed on their altars. 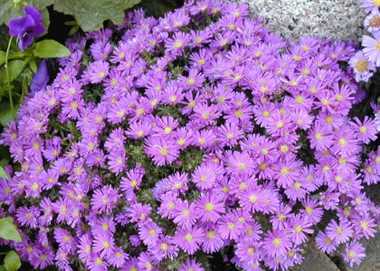 Aster leaves were burned to keep away evil spirits and drive away serpents in ancient Greece. The bite from a mad dog was cured by an ointment made from asters. Pliny the Elder recommended a tea of aster in cases of snake bite and an aster amulet to ease the pain of sciatica – and Virgil wrote that the flavour of honey would be improved if asters were boiled in wine and placed near a beehive. The aster is considered a herb of Venus and like the daisy, which belongs to the same family of Compositæ, it has been used in love divinations. One ancient myth arises from the Iron Age, when people learned to make weapons of iron. The mighty lord of the gods, Jupiter, was so angered by the destructive fighting with these hideous iron weapons that he decided to erase the entire human race by means of a flood. The gods fled the earth and the last to go, the goddess Astræa, was so saddened that she asked to be turned into a star. When the flood waters receded, all that remained was mud and slime. Astræa felt so sorry for them she wept, her tears falling as stardust which turned to lovely starflowers, or asters. The aster amellus or Italian Starwort is the original plant dedicated to the Archangel Michael. This delightful flower blooms in September, which is no doubt why it has been called, in Christian times, the Michaelmas Daisy. The Christian Feast of St Michael has roots in a pagan past, but became a major holiday during the Catholic ascendancy, when it was a holy day of obligation. The feast has gradually diminished in importance in recent times (its status as a holy day of obligation has been removed), remaining but a shadow of its former self. Nevertheless, the essential, seasonal nature of the festivity is deeply ingrained in our culture, a fact that was not lost upon the early leaders of the Church, as they managed the transition from the ancient pagan ways to the newer Christian dispensation. Christian Feasts replaced their pagan competitors, smoothing the pathway to the new faith. Lady Day marks the Vernal Equinox, St John's Day marks the Summer Solstice, Michaelmas the Autumnal Equinox and Christmas the Winter Solstice. This is the cardinal cross that lies at the heart of tropical astrology—and at the centre of the Christian system. The astrological symbolism is deep, and underpins our archetypal responses to all four of the quarter day celebrations. 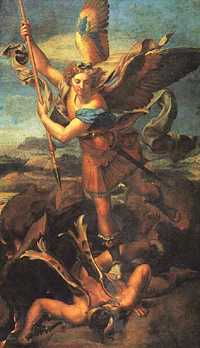 St Michael the Archangel, Catholic Online. This is part of a huge resource on Catholicism, with excellent calendars for feast days, saints, patron saints, angels etc. 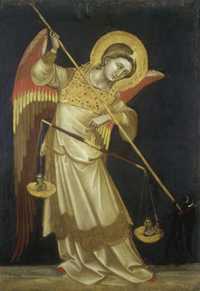 St Michael the Archangel, Catholic Encyclopedia. A fascinating and valuable resource, if you can overlook the tendentious style and have the necessary background, though it is well hyperlinked. Feast of St Michael, Fish Eaters. Well worth reading. This site claims to show the "whys and hows of traditional Catholicism" and much interesting, well-written material. Archangel Michael, Wikipedia. There is a comprehensive examination of Michael on Wikipedia, with many religious perspectives, from the mainstream Jewish, Christian and Muslim, to the New Age, Popular Culture, and the Occult. Meaning and Legends of Flowers, a curious and fascinating on line resource. Michaelmas Daisy, School of the Seasons, a valuable presentation by Waverley Fitzgerald, author of Slow Time: Recovering the Natural Rhythm of Life.